brown sugar recipes, brown sugar dessert recipes. Brown sugar is a type of sugar that is a mix of sucrose and molasses. They are found either dark brown to light brown in color as the sugar crystals are coated in molasses which basically means that darker the sugar, the more molasses it has. Brown sugar is used in desserts and baked goods to give them more flavor. It can be used as a replacement to maple syrup in many recipes as well. Brown sugar caramelizes much better than white sugar and that’s why it is preferred over white sugar sometimes. Brown sugar has the tendency to taste caramel-y when cooked and that gives the cakes a much better taste. Chocolate Coconut Cake is a recipe that utilizes brown sugar in the exact same way. It is a dense cake where the caramel and coconut taste go hand in hand together. Chocolate Banana cake too has the delicious taste of brown sugar coming through in every bite you take. For many occasions like Thanksgiving in America they serve pies and cobblers. Apple Cobbler is apples stewed in brown sugar, lemon and cinnamon (all the classic flavors), then topped with a mix of flour and sugar and baked till it's nice and bubbly! With the same flavors we have the classic Apple Pie. The apples are covered by a soft, buttery pastry with the crunch of almonds that betters the texture. One thing we know for sure – cinnamon and brown sugar is a winner combination and will always taste amazing together. Add them to another guilty pleasure ingredient, a soft dough, and you have amazing bakery style Cinnamon Rolls. A warm pear filling where the chopped pears are caramelized with brown sugar can be served inside Spiced Pancakes, laced with cinnamon and nutmeg. These pancakes are perfect for a chilly winter morning or evening and taste so much better with a little chocolate drizzled on top. Replacing brown sugar with regular sugar gives a richer taste to the dessert. A somewhat guilt free cookie, Chocolate Chip and Oatmeal Cookie, is flavored with brown sugar. The intensity of the flavor really comes through the oatmeal, making it delicious. For the ones that eat their cookies with decadence, you can try the Chocolate Cookies. They are milky, buttery, soft yet crispy with a slight caramel-y taste from the brown sugar. Puranpoli is a traditional Maharashtrian sweet paratha that is usually made with chana dal and jaggery but you can give it a different twist but dates, brown sugar and sesame. Not only is this dish tasty, it is healthier than the traditional one. Another really great recipe is the Barbecue Sauce. This sauce is a smoky, rich sauce that has a slight hint of sweetness from the brown sugar. If you want to know more about the Uses of Brown Sugar, then you can check out our article on that. 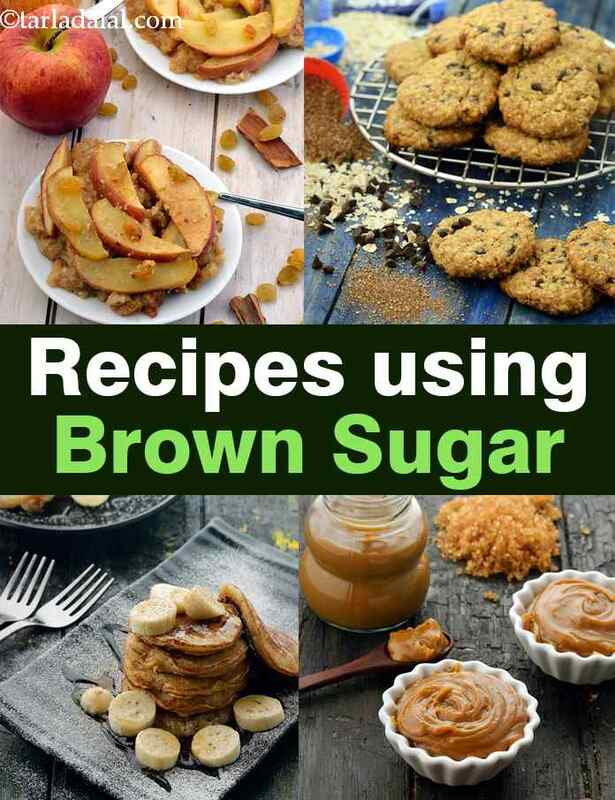 To know about Recipes using Brown Sugar, check out our collection. Enjoy our brown sugar recipes, brown sugar dessert recipes given below.